Lighting City Hall’s dome will help celebrate and build community spirit in Baltimore City. 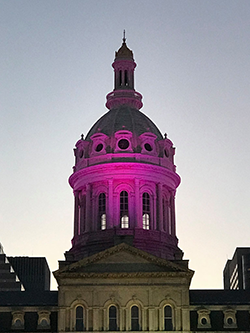 When the dome of City Hall is lit it presents a beautifying element to our downtown, a symbol of pride for citizens and becomes a part of Baltimore’s rich history. Organizations are invited to make requests to light City Hall’s dome based on the criteria outlined below. We strive to fulfill all eligible requests, but any confirmed request may be modified if a major, local, national or international situation occurs. Applicants must be not-for-profit and community-focused. Applications received must be at least 14 days prior to the requested light up date. Supports an event of national or international significance (such as Fourth of July, Valentine’s Day). Supports a local festival or event that positively impacts local community spirit (such as Light City, AFRAM, Baltimore Ravens). Supports a local, national or international awareness issue that builds community or is related to community health (such as Heart Healthy Month, the Race for the Cure or Awareness of Violence Against Women). Acknowledges and welcomes visiting dignitaries (such as a visiting Head of State or Ambassadors from various countries) hosted by our city. We will not light up City Hall for an organization or group that is deemed to be inappropriate, offensive in nature, or those supporting discrimination, prejudice, violence or hatred. We will do our best to fulfill your color request, but the exact hue may not be possible. We will use the closest hue that we can achieve through LEDs. We cannot light City Hall with browns or blacks at any time. Please list the color or colors you would like to use in the boxes below. One color per box please.